The Cardiovascular Health (CVH) Program's mission is to provide leadership in the state of Alabama to prevent death and disability from heart disease and stroke, eliminate disparities in health and health care, and work with its many partners to fully implement a plan focusing on policy and system changes in the worksite, healthcare, and community settings. The American Heart Association and the American Diabetes Association present a new educational podcast series, "Know Diabetes by Heart." The series will focus on the link between cardiovascular disease and type 2 diabetes. Episodes are now available online. Join the American Heart Association to turn the State Capitol red on Alabama Advocacy Day. 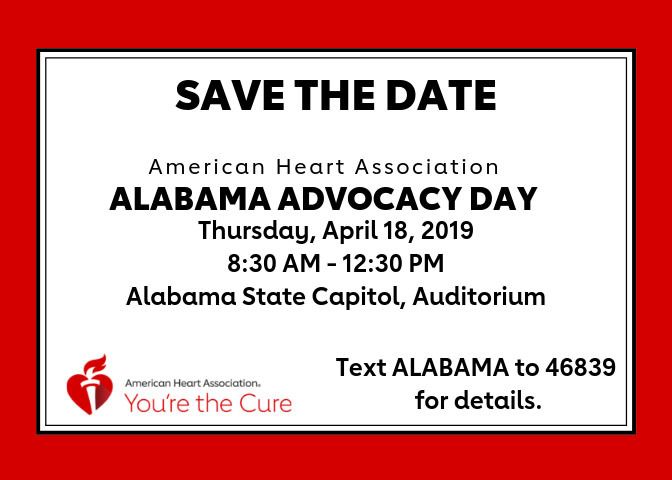 The event, scheduled for April 18 from 8:30 a.m. to 12:30 p.m.at the Alabama State Capitol, aims to raise awareness of policies that would help prevent and treat heart disease and stroke. The day starts with an Advocacy 101 training, and continues with a Move More Rally on the Statehouse steps at 11 a.m. Registration is now open. A new resource for physicians is now available through a joint effort of the American Heart Association (AHA) and the American Medical Association (AMA) to help treat patients with high blood pressure under the new blood pressure guidelines mentioned below. Meet and learn from hypertension experts at the Interactive Workshop on Hypertension on May 2 at Lister Hill Library in Birmingham. Topics and demonstrations will include how to measure blood pressure, on-site telemetry, and more. See our flyer or email faithlang@uabmc.edu for more details. The American Heart Association has a new campaign "This is What High Blood Pressure Looks Like." You might not see or feel its symptoms, but the results — a heart attack or stroke — are far from invisible or silent. The site provides tips on talking to your doctor and committing to a plan to lower your blood pressure. The CVH Program has teamed up with the Montgomery YMCA to offer blood pressure self-monitoring. Here is a flyer and a handout about the program. For information on how to take your blood pressure, please view this infographic. The AHA recently released new blood pressure guidelines that redefine high blood pressure. Here are some AHA resources to help you keep track of your blood pressure under these new guidelines. Dr. Suzanne Oparil, MD, FACC, FAHA, FASH, FAPS, gave a presentation on the new blood pressure guidelines at a recent meeting of the Alabama Cardiovascular Health Network. Untreated hypertension can cause serious health consequences or death. Prevention is key. Learn more about high blood pressure, the "silent killer." Million Hearts has made available some useful resources for both patients and providers about maintaining high blood pressure. A two-page handout entitled "High Blood Pressure: How to Make Control Your Goal" is geared towards patients and provides a general outline of how to manage the condition. Million Hearts also compiled a toolkit for practitioners, patients, and their families about maintaining healthy blood pressure levels. About 70 million American adults have high blood pressure - that's 1 out of every 3 adults per the Centers for Disease Control and Prevention (CDC). Only about half (52%) of those with high blood pressure have their condition under control. Nearly 1 out of 3 American adults have blood pressure numbers that are higher than normal, but not yet in the high blood pressure range. High blood pressure costs the nation $46 billion each year which includes the cost of health care services, medications to treat high blood pressure and missed days of work. ADPH created the 2016 Blood Pressure Control for Better Health program to provide practical steps for blood pressure control. The two-hour program is specifically designed for nurses, social workers, clinicians, public health and pharmacists. The CDC has released resources concerning healthy living habits for heart disease prevention. By living a healthy lifestyle, you can help keep your blood pressure normal and lower your risk for heart disease and heart attack. The Million Hearts program has also made available information concerning prevention of heart disease and stroke. Review these resources today and learn more about how you can protect your heart! High blood pressure and hypertension affects thousands of Alabamians. Here are some resources to help you reach those patients who suffer from these conditions. High blood pressure, high cholesterol, diabetes, and smoking continue to put more people at risk for heart disease and stroke. To address these risk factors, CVH is focusing on the ABCS of cardiovascular disease prevention. One regular aspirin (325 mg) every other day. Normal blood pressure should be at or below 120/80. Ask your provider about how often to check your cholesterol. Normal total cholesterol levels should be below 200. LDL (bad cholesterol) should be below 100. Research shows using a quitline with medication increases abstinence rates. Ask your provider about quitting, or call 1-800-QUIT-NOW or visit the Alabama Quitline for more details. Stroke is an emergency. If you are among the millions of Americans who are not yet familiar with the symptoms of stroke, here is a quick and easy way to remember how to recognize a stroke when it happens to someone you know. Remember the word FAST. Can the person smile? Have their mouths or eyes drooped? Can the person raise both arms? Is one arm slightly lower? Can the person speak or see clearly and understand what you say? Time loss is brain lost. Call 9-1-1. Visit About Us for more information relating to the Cardiovascular Health Program.